KONINKLIJKE MARINE (Royal Dutch Navy). Free use copyright applies. Dimensions 433' by 40'9" by 14'2"
1942: 2 3" AA guns, 6x1 20mm Oerlikon AA guns added. Radar installed. One depth charge thrower and the seaplane removed. 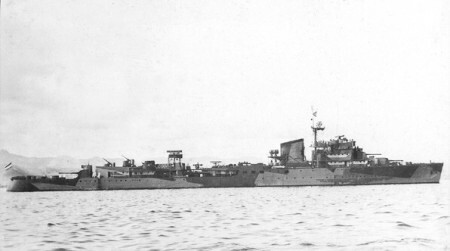 1943-11: 2 additional 3" guns added. The quad 0.50 machine gun mount was replaced with four singles. The Tromps were very small and lightly armored cruisers, in some respect resembling armored super destroyers. Authorized in 1931, they were originally intended to serve as destroyer flotilla leaders, but this may have been a political ploy to slip a light cruiser design for Far Eastern waters into the Navy budget. The second ship of this class, Jacob van Heemskerck, was still incomplete when war broke out in Europe. She was completed in Britain as an antiaircraft cruiser and is described separately. Tromp herself was with Task Force 2 in Sunda Strait when war broke out. She spent the entire war in the Pacific Theater.